If you aren’t sure how your child should brush at home, your dentist can walk you through the best methods based on their age. 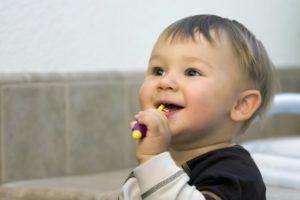 For example, with children under 3 years of age, you’ll want to find a toothbrush with a head and handle small enough to brush their small mouths comfortably. When using toothpaste, use a smear no larger than a grain of rice to prevent them from swallowing too much on accident. You won’t have to worry about flossing until more of their teeth start coming in. For children older than 3, you’ll start using a bit more toothpaste (about a pea-sized amount) and start letting them brush their teeth on their own but with supervision. They’ll also be more inclined to use floss as more teeth start to erupt. Fluoride – It’s possible your child isn’t getting enough fluoride from the water they drink, especially if it’s bottled water and not from the tap. Your dentist in Norwood provides a fluoride mouth rinse to protect and strengthen tooth enamel. Dental Sealants – This thin plastic film is ideal for protecting the deep grooves and pits where bacteria and food get trapped easily. These are ideal for molar and premolar chewing surfaces. Athletic Mouthguards – If you’re child participates in sports, especially higher-impact sports such as football, you’ll want to consider getting them a custom-made mouthguard to protect their developing teeth. Your dentist understands that cavities aren’t always avoidable, and they can occasionally occur. That’s why they offer metal-free, tooth-colored fillings to restore their teeth. If their teeth have broken due to injury or severe decay, they can also receive stainless-steel dental crowns for added protection. Let February be the month you help your child commit to oral health. Schedule your child’s appointment with their family dentist in Norwood today! Central Dental Associates has many doctors who are dedicated to your child’s oral health. After serving the Norwood area for over 50 years, they’ve been able to add the most state-of-the-art technology and personalized care for your family. To learn more about their preventive and restorative child dental care, contact the office at (781) 769-3566 or visit their website.